available April 26 for $1,980, is the first foldable smartphone available in the U.S. from a major manufacturer. It’s also, Samsung hopes, a way to reinvigorate a slumping smartphone market.” data-reactid=”22″>Samsung’s Galaxy Fold is the future of smartphones. At least that’s what the South Korean tech giant would like you to believe. The Fold, available April 26 for $1,980, is the first foldable smartphone available in the U.S. from a major manufacturer. It’s also, Samsung hopes, a way to reinvigorate a slumping smartphone market. Despite debuting the Fold back in February, Samsung is only just now giving reporters their first hands-on experiences with the phone. And while I was admittedly skeptical of the Fold — because it’s expensive and strange — I’m far more interested in it now that I’ve had time to use the device. I’ll have a full review of the Fold soon, but my first impressions of the handset are that it’s far more useful than I initially suspected. It could genuinely embody the next step in smartphone evolution. My first thought when I opened the Galaxy Fold was “Please don’t break this thing.” After all, it’s a nearly $2,000 smartphone. But the actual hinge mechanism that Samsung has developed for the Fold helps ensure you won’t open it up so hard so as to break the handset in half. There’s a satisfying “thunk” when you open the Fold up to expose its 7.3-inch touch screen display, and an even more pleasing clap when you snap it shut. Samsung says the hinge and the screen’s seam are guaranteed to open and close 200,000 times without seeing an issue with either. To put that in perspective, you’d have to open and close your Fold 100 times a day for 5 years to hit that number. And chances are you’re not going to open up the Fold every time you want to check out a notification or answer a text message. That’s because the Fold’s 4.6-inch cover screen offers the same functionality you’d expect from a smartphone display. You can do everything from watch Netflix to browse the web and send emails from the cover screen. The one issue with the Fold is that because there are so many moving parts, Samsung couldn’t make it dust- and water-resistant. So you’ll have to make sure you keep it away from any drinks or pools. Why do you need a foldable phone? Samsung’s pitch for why the Galaxy Fold exists is simple. People love big screens, but they want phones they can use with one hand. By making the cover display small enough to use with one hand, and the main screen so large, Samsung hits those goals. One of the more interesting aspects of the Fold is Samsung’s app continuity feature, which lets you start an app on the cover display, then open the main panel to view the app in all of its big-screen glory. This is an especially helpful feature for apps like emails, texts, YouTube, the web browser — anything you might open on the smaller screen, but then decide needs a closer look. You can also set certain apps to work in the opposite direction. That means you can view them on the main screen, then close up the phone and continue using the app on the cover display. This could prove particularly useful if you’re using Google maps to search for a location, and then close the Fold to view your directions on the smaller cover screen. Samsung is also pushing multitasking as a major reason for the Fold’s large inner display. The company showed off how you can run three apps at the same time and interact with each of them live. So you can look up a place to eat in Chrome, text the address to your friend, and navigate there using Google Maps all at the same time. firm’s new wireless Galaxy Buds. That’s also a bit of a public relations move, as the Fold doesn’t have a standard headphone jack.” data-reactid=”62″>Samsung recognizes that the Galaxy Fold is a premium device, especially at its price. To that end, the company has taken the step of including a case with the handset, as well as the firm’s new wireless Galaxy Buds. That’s also a bit of a public relations move, as the Fold doesn’t have a standard headphone jack. The handset also has a whopping six cameras. There’s a 10-megapixel camera on the cover, another 10-MP paired with an RGB camera on the inside for taking portrait-style selfies, and three cameras around back with wide-angle, ultra-wide-angle and telephoto lenses. Inside, the Fold gets Qualcomm’s latest Snapdragon 855 processor, 12GB of RAM and 512GB of storage. The Fold also supports wireless charging and wireless power sharing, so you can let others wireless charge their devices from your phone. 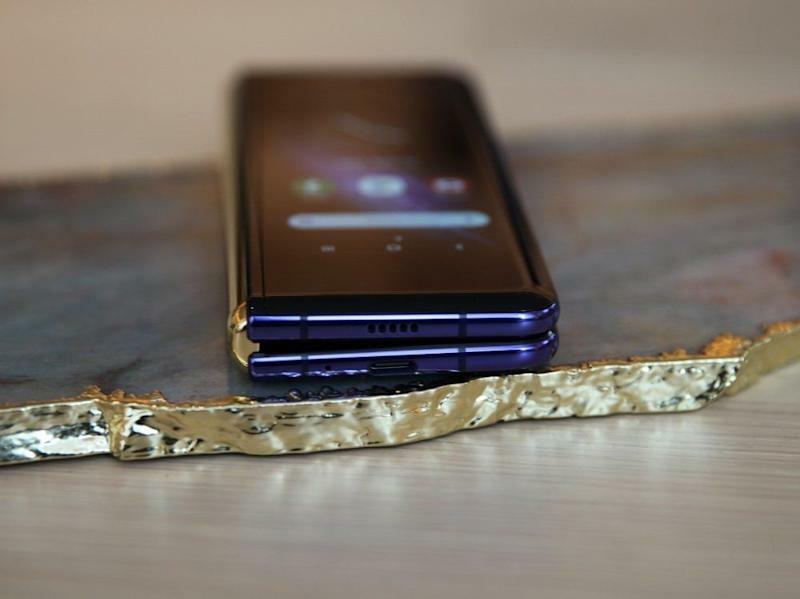 The Galaxy Fold will have to do some serious heavy lifting for Samsung if the device is to help revitalize the global smartphone market. Sales of handsets in the U.S. have been slowing as fewer consumers see a need to upgrade their handsets as often as in the past. China has also become a major battleground for Samsung, where it is fighting off competition from the country’s homegrown rivals including Huawei, which is also working on a foldable phone. The Fold is meant to be the smartphone that gives Samsung a new way forward, and it’s certainly going to be the kind of device you see in person for the first time and look on in awe. Will it change the marketplace, though? We’ll have to wait to see.